Great for indoor and outdoor use, the Amigo® Foal Turnout Blanket has a unique adjustment system that allows the blanket to grow with your foal. This adjustment system makes this blanket suitable for foals from birth with the option to expand by six inches in length. Turnout Sheet and Blanket materials are waterproof and designed to keep your horse dry. However, if your horse is turned out in a field without a run in shed or shelter during prolonged rain or heavy downpours, your horse may still get wet, especially in the neck and tail areas. When selecting a blanket ensure to take into account your horse’s behavior, environment, or other horses that may be turned out with your horse. The lower the denier number, the less strength the material has. 420 Denier and 600 Denier are not recommended for horses that bite, chew or rub on blankets, or for horses turned out with a companion or in a group. Always make sure your horse’s blanket is properly fitted and all straps are adjusted correctly. If a blanket is too tight or too loose, straps may break and material may tear. For younger horses or horses turned out with a companion or in groups, it is recommended to purchase 1200 Denier or 1680 Denier material, as these are stronger materials and are less likely to tear. Certain types of fencing, such as barbwire, or foreign objects, such as nails, will easily tear any blanket no matter what the Denier, so always inspect the area in which your horse is kept to remove any nails or jagged fencing that may cause damage. There are no horse blankets that are guaranteed to not rip or tear. Maybe the best blanket I’ve ever purchased. I was so pleasantly surprised. It’s NOT a pony blanket, it actually has an appropriate neck to fit a foal! Thrilled! Finally! 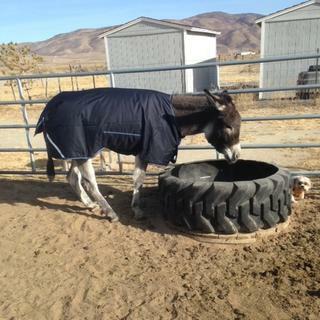 A Blanket that fits my donkey PERFECTLY! Photo says it all! This Amigo "Foal" turnout blanket fits my (average size) donkey perfectly. If your donkey measures 60" from center of chest to top of tail it should fit him perfectly too. Great blankets and a great fit that allows gor some adjusting. Our temps commonly hit -30 and this blanket kept my little guy warm and happy. Can't beat this brand for quality. My only complaint is the design of the straps (chest and belly). Having to go through the surcingles (sp?) is cumbersome for one person alone. This is especially evident during the first few donnings. Best foal blanket on the market!! Bought this winter Amigo foal blanket for my 7 month old Quarter Horse filly, just love the fit, the durability, and how there's a belly wrap (no straps)! Glad I found and purchased this for sure!! This blanket fits my foals so well. I love the adjustability factor. There are three sizes in the chest and three in the belly strap. The size you buy is with everything on the tightest setting, so buy the size your foal is now. I bought a little big and they still fit, but are a little too large. They will grow though! I would buy this again in a heart beat! I have bought this blanket 2 times, once when the foal was born, and again recently when he outgrew the first. He has LOVED them both! The exterior holds up very, very well, and the only thing I have about that is that he did manage to tear it. It was after quite some time and I actually believe he was scratching on one of our rougher trees. Wonderful price for such an amazing blanket. He is a very rowdy yearling now, and he was a very energetic colt. He managed to tear 2 other blankets before i got this one, and I am glad I found this one! I have always liked Amigo brand blankets and this one did not disappoint. I actually ordered it for a mini donkey and a pony, and while the length is perfect, the band around the belly is too small. Seems like it would fit a foal nicely. It is easy to adjust to the different sizes and I would definitely recommend it to someone shopping for a foal. If you're shopping for a mini or pony, you will need to spend the extra money on a pony-size turnout. I bought one of these blankets for my weanling and loved it. It fit him great and it's very adjustable. It also kept him nice and warm. My sister bought a Weanling that was a little bigger and older than mine so also bought one of these blankets in a larger size. It also fit her filly really well but the belly band's stitching ripped out the first night she wore it. Horse.com took it right back though. This is a wonderful little blanket, so well made, really stylish, however it was to small for my guy, but that was my fault in thinking he was smaller than he was, wish it had fit, love it. Wish they made it in all sizes. Had one previously and colt needed a new one. Lasts quite a while. love this blanket! fits my QH 8 month old great! needed 2 turnout blankets for my foals for this winter.Its suppose to get cold, windy, good chance of snow. I wanted them to have something to help keep them warm considering we dont have a barn built yet, currently we have some group shelters and wind breaks. I purchased for a yearling pony. My daughter had purchased one previously for her yearling TB, and it fit and looked wonderful. The adjustable size is great for young animals. Work on our Shetland Pony great. Does the blanket stay straight over the back of the horse without there being any leg straps? blanket stays nicely and we have a lively colt. Are the chest straps/belly band buckled/clipped or Velcro? I am buying this for my mini-donks, but the goats in the herd take of their blankets if they are secured with Velcro. BEST ANSWER: Sorry! I was looking at the wrong blanket. It is all Velcro but it is double velcroed so you secure one flap and then there is a second flap that goes over it. It is very secure but I know goats are mischievous. I also have the Weatherbeeta 1200D foal rug (size 45) which is like a normal horse blanket (the one I described before) and has no Velcro. The front is a buckle and the belly straps are like a normal horse blanket (the metal bar that you twist into place, not sure what those are called). It has no Velcro on it at all. They are Velcro that wraps around a buckle. I used this on two yearlings in the same pasture that remove everything from each other and the straps never gave. Love this blanket. it's a hook/chip system, you slide the hook into a slit then turn it to click it into place. They are thick velcro it's a very nice blanket! All the straps are of wide Velcro. BEST ANSWER: These blankets fit well and are somewhat adjustable to grow as well. They kept my baby warm and happy. I really like the belly band feature too. This is a wonderful blanket for the little ones! easy on/off keeps them warm and toasty! Very durable and easy washing. yes .. excellant quality blanket kept my colt plenty warm. our temps dropped to 19 with snow. The blanket is good quality and fits great! I would highly recommend it! Can leg straps be used on this blanket? BEST ANSWER: Not in its current condition. I have had to make a few adjustments that were easy and fast with a sewing machine. ! I added a large Velcro strip to the outside of the belly flap and the other piece of it to the center of the back so when you are taking the blanket off the first few weeks the large belly flap doesn't have to hang down and freak your pony/foal! And I hooked leg straps to the eyelet of the tail strap and measured around under the leg and added an eyelet on the inside to attach them too! I used leg straps from an old blanket and now have the perfect pony/ foal blanket ! Great quality blanket and great price just needs a few adjustments for new ones and spooky ponys! No, not without sewing on the D rings to attach the straps to and that would allow leaking. I was very concerned about no leg straps but the blanket seems to work very well without. The problem that I ran into instead was that even though there are three different adjustments for the straps, I had to additional Velcro to the belly straps to make them fit correctly. I would call my baby average size for his age. But other then that I love the blanket. Keeps him very warm and dry. Well worth the $$$ spent. There are no leg straps, but they are tailored well enough that they stay in place. I have 2 foals wearing them and haven't had a problem with them coming off...and they are pastured together so these blankets have really been put to the test! there are no d's to hook leg straps to, it has the belly band and a strap behind that goes under the tail. I have it for my donkey and it fits him great with all the adjustments it has! BEST ANSWER: Turnout Sheet and Blanket materials are waterproof and designed to keep your horse dry, however if your horse is turned out in a field without a run in shed or shelter during prolonged rain or heavy downpours your horse may still get wet especially in the neck and tail areas. Yes it is mine seemed to run a bit small though. Yes it is waterproof. I wish it had leg straps. What is the proper way to deal with the tail flap strap with a filly? The strap looks like it will get completely soiled. BEST ANSWER: My colt is very active, running and rearing and I did not attach it. The blanket stayed with no problems. The design of the blanket helps keep it secure enough without having to use the tail flap strap. You can remove and wash it with a dunk in cold water and mild detergent, and a quick scrub with a cleaning brush. Does this keep the rain off of the colt? my foal is a 52" what size should i get? BEST ANSWER: Each size expands by six inches in length, so you could try a size 48 which can expand to 54", or if you want to start bigger, you might consider a size 54, if you don't think that would be too large to start. BEST ANSWER: This foal blanket is waterproof and fits the foal nicely! It also allows room for growth without looking too bulky.